Broken Dentures | Dr. Sheetal Sachdeva B.D.S. 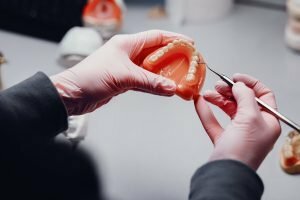 One of the most serious dental emergencies for patients, especially older ones, is broken dentures. If you have broken dentures, chewing and talking can be a difficult task. It is most common in the dentures for the upper jaw but occurs with lower jaw dentures as well. Your Wantirna South dentist provides several options in dealing with your broken dentures. If you want to learn more about broken dentures, read on. There are several reasons for broken dentures. One of the most common reasons is natural wear and tear. Dentures, if worn for a long time, wear out naturally. Like other prosthetic devices, they get break down after long cycles of chewing and daily wear. Following natural wear and tear is shrinkage of the jawbone and the gums, making the dentures fit loosely. When the dentures don’t fit properly on the jaw, they may move around a lot and chances increase that they may break during a single wrong bite. Dentures must be removed at night to help your gums and bones relax and keep your tongue from getting bitten while asleep. By merely taking your dentures out of your mouth, there is a risk that you may accidentally drop or misplace your denture, which may result in breakage. If your denture breaks, call your Wantirna South dentist immediately to request a denture repair appointment. There are available denture repair kits in the market, but we don’t recommend using them. Fixing your dentures at home may cause more serious problems in the future. Proper repair of a denture requires expert knowledge and skill as well as materials. If you attempt a temporary repair of your denture at home, there is a chance that we may not be able to repair the denture. When your dentures break, all you think about is how and when can you get them fixed. At Dr Sachdeva’s clinic, we provide safe and effective denture repairs for you and your family members. We are determined to help you feel good even when wearing restorations.